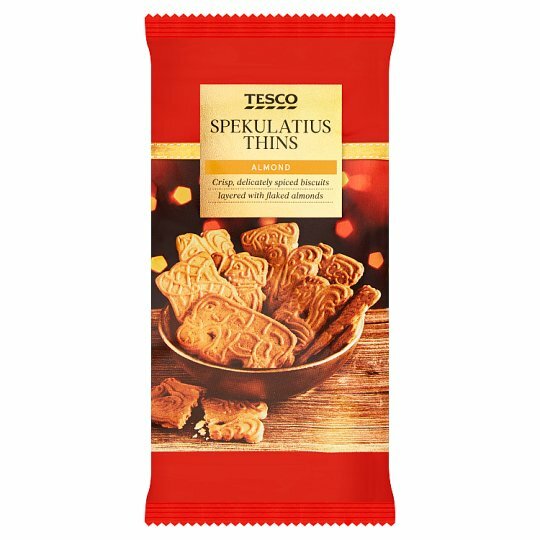 Spiced biscuit thins with almonds. Made to a traditional recipe/Patterned using traditional rollers. Crips, delicately spiced biscuits with a layer of almond slivers. INGREDIENTS: Wheat Flour, Sugar, Palm Oil, Glucose-Fructose Syrup, Almonds (6%), Raising Agents [Diphosphates, Sodium Bicarbonate], Emulsifier (Sunflower Lecithins), Dried Skimmed Milk, Cinnamon, Wheat Starch, Spices [Clove, Aniseed, Coriander, Allspice, Mace, Ginger, Nutmeg, Cardamom], Salt, Flavouring. May contain egg and peanuts. For allergens, including cereals containing gluten, see ingredients in bold. Also, may contain peanuts, other nuts and egg..